It’s starting to feel like summer! And during the summer, I crave s’mores 24/7. Growing up, s’mores were a must at every summertime bonfire at the lake. My cousins would look forward to jumping in the water and swinging on the rope swing…and I would dream about those hot, marshmallowy s’mores every year. During the wintertime, my grandfather ignites the fireplace and we roast marshmallows in the comfort of a warm, cozy home. But in the summer, I need s’mores right away. Without a fire. And preferably with brownies! Are not your regular brownies. 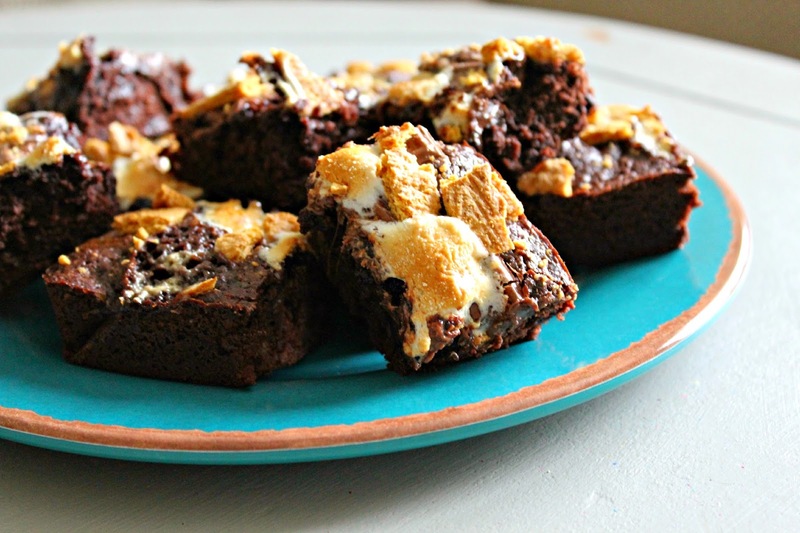 And they are not your regular S’mores brownies either. I would like to owe some of the greatness from these moist, delicious brownies to Trader Joe’s Truffle Brownie Mix. 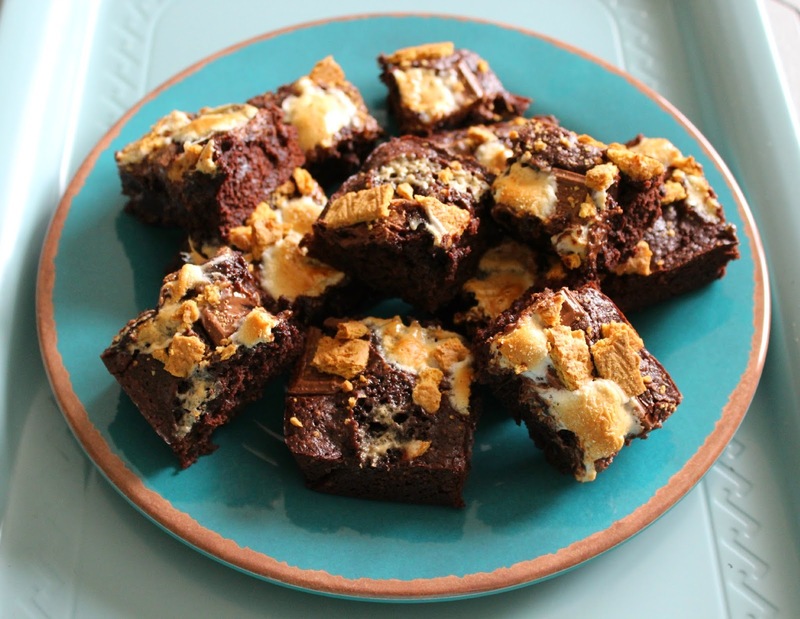 This mix yields a moist, delicious brownie that seriously melts. In. Your. Mouth. 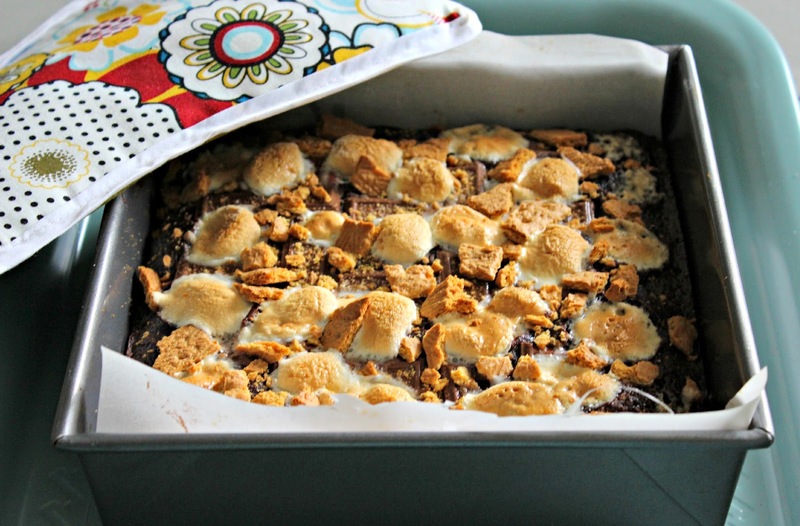 The rich chocolate chip pieces and chewy, cake-like texture provide the perfect base for the s’mores toppings. I’ve made a lot of brownies in my life. And Joe the Trader….you, my dear friend, have outdone yourself with this mix. I’m sure any other brownie mix would work with these treats. But if a Trader Joe’s is convenient, hop on over there and purchase the Truffle Mix as soon as possible. Your anxious tastebuds will thank you. 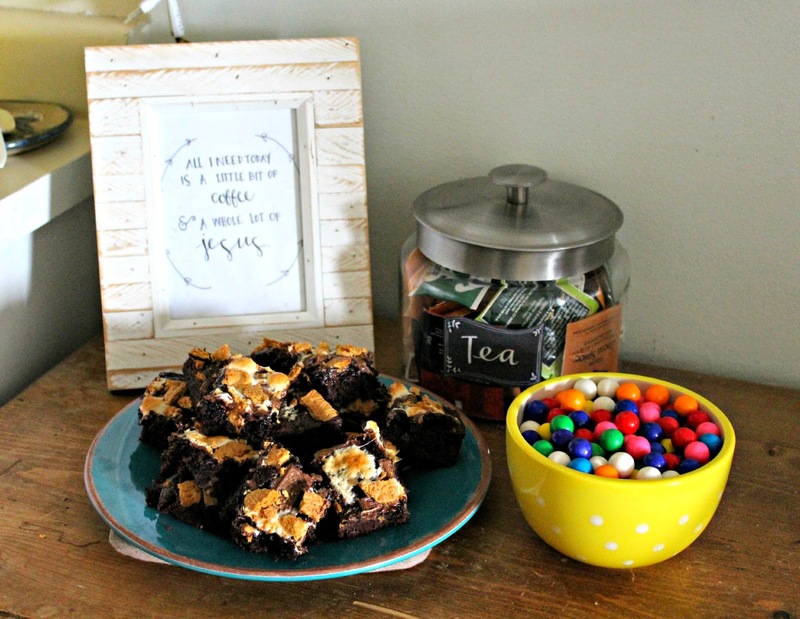 The Truffle mix calls for one stick of butter, but for these S’mores brownies, I used ¼ cup of applesauce and ¼ cup of Coconut Oil instead of the butter. The applesauce made these delights moist and sweet while the Coconut Oil gave the brownies a slight German Chocolate-like taste. The coconutty undertones…Mwahahaha. So good. Like summer in your mouth. I’m not even a huge coconut fan, but the coconut oil works a kind-of-sort-of magic.You know what else works a kind-of-sort-of magic? Cinnamon. A sprinkle of cinnamon in your brownie batter brings out so much chocolatey richness. It is unbelievable. You won’t be able to taste the cinnamon, but man oh man! Does it do so much to the flavor composition! Just do it! Again, your tastebuds will thank you. Melt your coconut oil and applesauce together for a few seconds in a double broiler or in the microwave. Mix 2 eggs and the melted oil and applesauce together in a large mixing bowl. Add your truffle brownie mix and 1 tsp. of Cinnamon. Mix just until incorporated. Spread the batter in a coconut-oiled 8x8 baking dish (You can also spray Pam or butter the pan here). I laid parchment paper in the 8x8 pan and then coated it to prevent sticking. This makes taking the cooled brownies out of the pan a lot easier once they are finished baking. Next, toss some mini marshmallows across the top of the batter. You can get creative here with the amount of marshmallowy goodness you would like to add. I didn’t add too many mallows because I wanted the moist brownie mix flavors to be the center of attention. Next, break up your Hershey Bar pieces and distribute them on top of the marshmallows. Finally, sprinkle your grahamcracker crumbs on top of the Hershey pieces. Slide these gems into the oven and bake for exactly 25 minutes at 350 degrees. Immediately remove the brownies and set them in a pan of ice and cold water. This will keep the brownies moist and scrumptious and prevent them from drying out and overbaking. This step is optional but by setting the brownie pan in the ice water, the baking process stops and your brownies will remain gooey and melty. Now, you must wait an hour before trying these jewels. I know…it’s ridiculously hard. Especially when the sweet marshmallow s’more scent is swirling and wafting its wonderfulness throughout the kitchen and you just want to dig your face into the gooey chocolate pan. Withhold. I have faith in you. Paint your nails, watch Friends re-runs, lick the brownie batter out of the mixing bowl while you clean the kitchen. It’s rough, but worth it. Absence makes the heart grow fonder. And you will be so fond of these by the end of the hour, you will be begging for s’more and s’more. 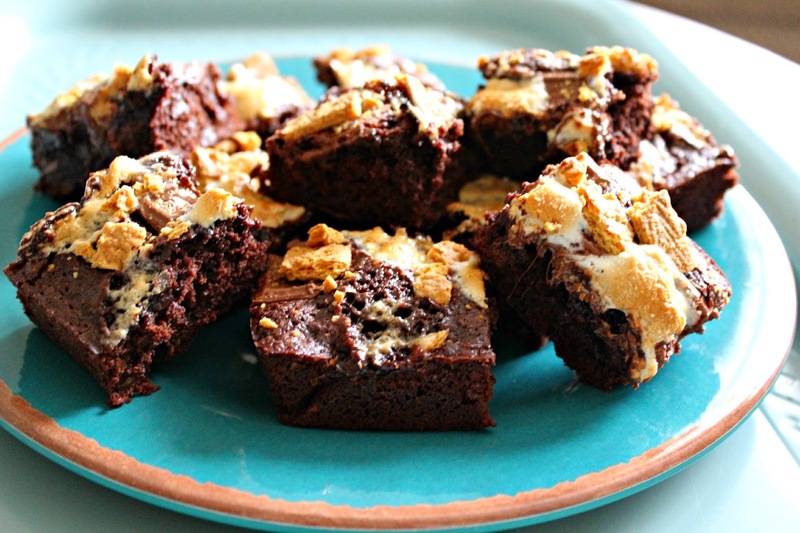 Once you have waited the full hour, you are free to devour these brownies as you wish. I usually like ice-cream with my brownies, but these need absolutely nothin’. 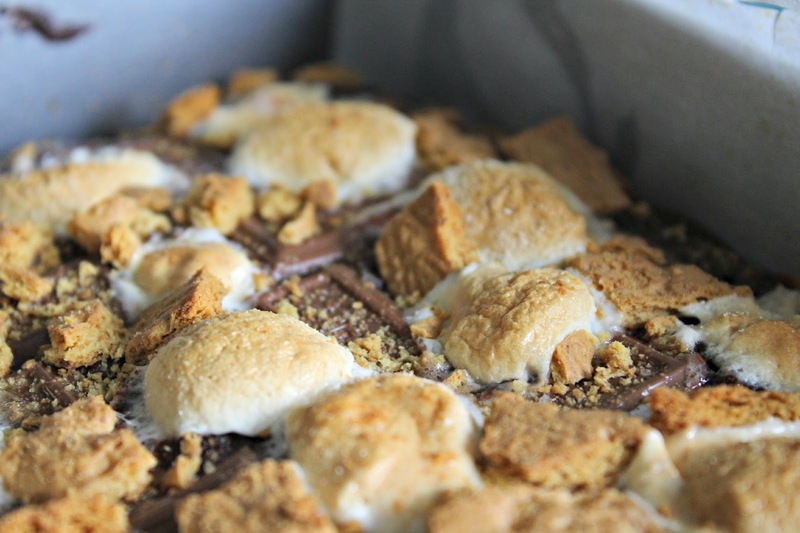 The wonderful s’more layer on top of the moist, rich, brownie cushion is just so sweet and soft and summery. Bring these to your next barbecue. Or surprise your neighbors with a summer s’more treat. These are summer perfection. they are heavenly. and so easy too! they are so, so great. Let me know when you make them!